Shechen Guest House belongs to Shechen Monastery & any profit achieving goes for monks' daily needs; education, food, clothes etc. Shechen guest house is inside Shechen Monastery's compound. Shechen monastery is happy to welcome guests and visitors to what now has emerged as no less than a veritable oasis. The friendly and capable staff, the good dining, the delightful lush courtyard garden, and a variety of comforts and services, all provide what it takes for you to have a home in Boudhnath. Here you can breathe and relax happily and in peace, enabling you to take in the many wonderful sights and experiences Kathmandu and Boudhnath can offer you. 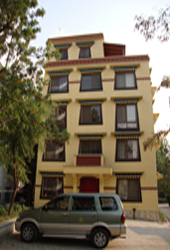 Shechen (previously Rabsel) Guest House was constructed in the early 90's at the wish of Shechen Rabjam Rinpoche. It offers 23 quiet and comfortable rooms, each with its own bathroom and hot water, opening out to the pleasant garden courtyard. Also available to guests are laundry services, postal and international communication service, including email and internet access, and room service. Shechen Guest House's vegetarian garden restaurant, the Rabsel Café, offers an appetizing variety of freshly prepared local and international dishes, and the kitchen staff takes care to keep the highest standard for health and hygiene. 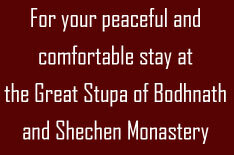 The guest house is next to the Shechen monastery, and only a few minutes walk to the Great Boudhnath Stupa. Designed by Radiant InfoTech Nepal © 2007 Shechen Guest House. All Rights Reserved.